Yes, I have two Big Green Eggs. I’ve had egg #1 since moving to TX in 2007 and egg #2 was just acquired about a month ago. I had a 20% off coupon to a local egg dealer and couldn’t pass it up. 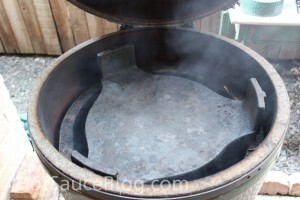 BGE’s are rarely on sale, so I jumped at the chance after saving some pennies. 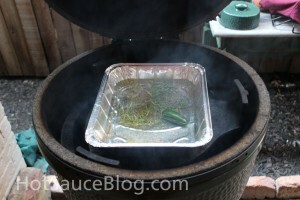 Once I had egg #2 home, I started venturing out with new recipes and smoking techniques. 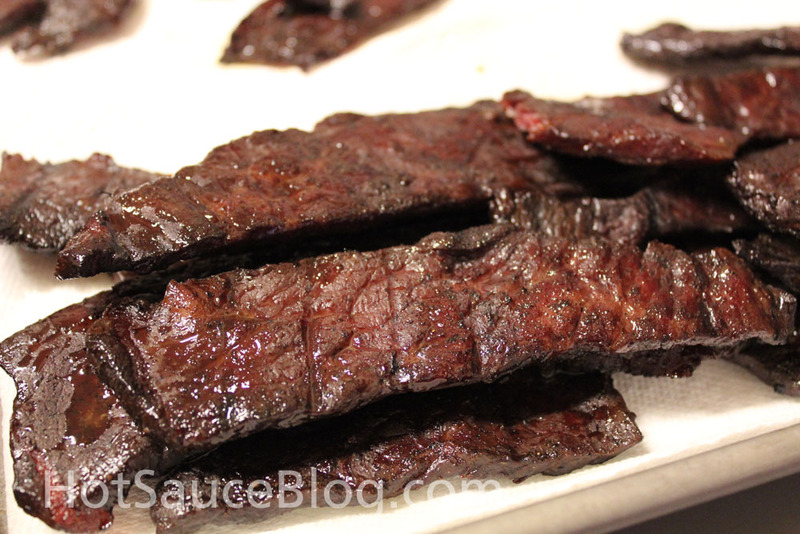 I had never made jerky on the egg before (no clue why), so that was one of the first projects I decided to tackle. 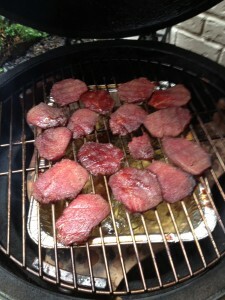 This is now my 4th attempt at jerky on the eggs – each one more delicious then the other. 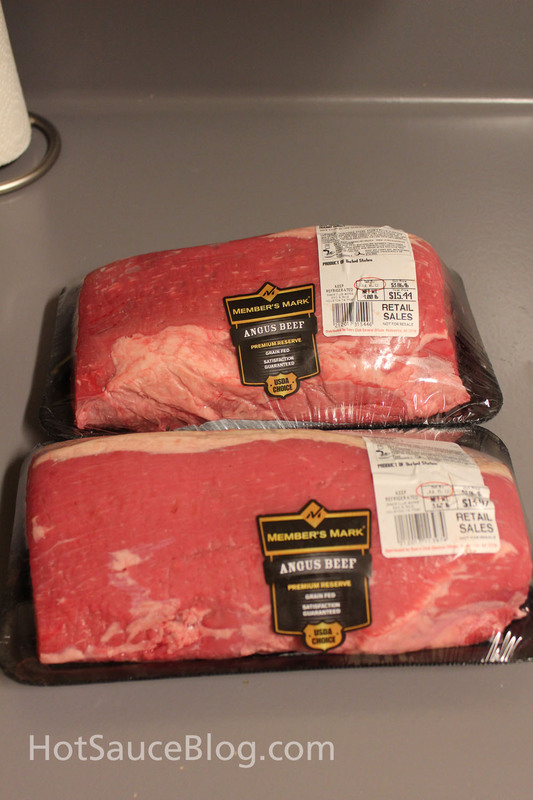 Step 1: I bought 2 top rounds from Sam’s Club on Thursday evening and prepared to prep them Friday morning (they need to cure for 24 hours before smoking). Trim the fat caps from the rounds and then slice into 1/4 inch chunks/strips. 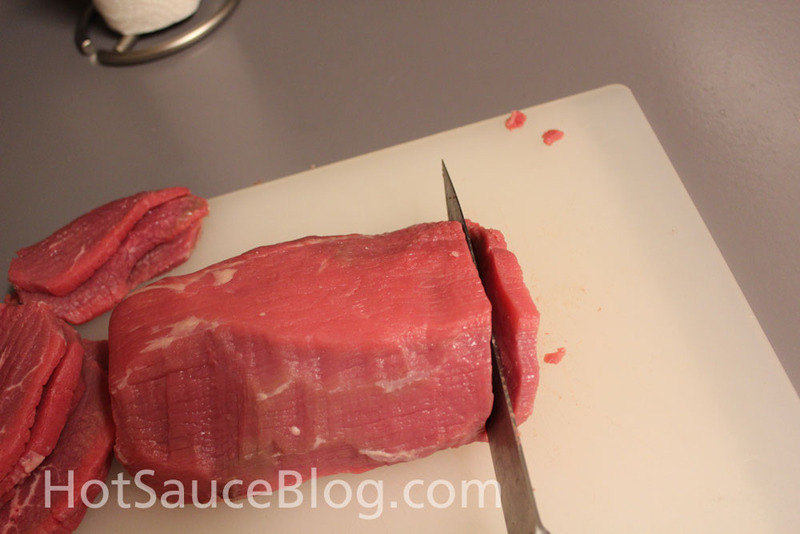 As you go also trim the fat from the slices – this is the detail work. 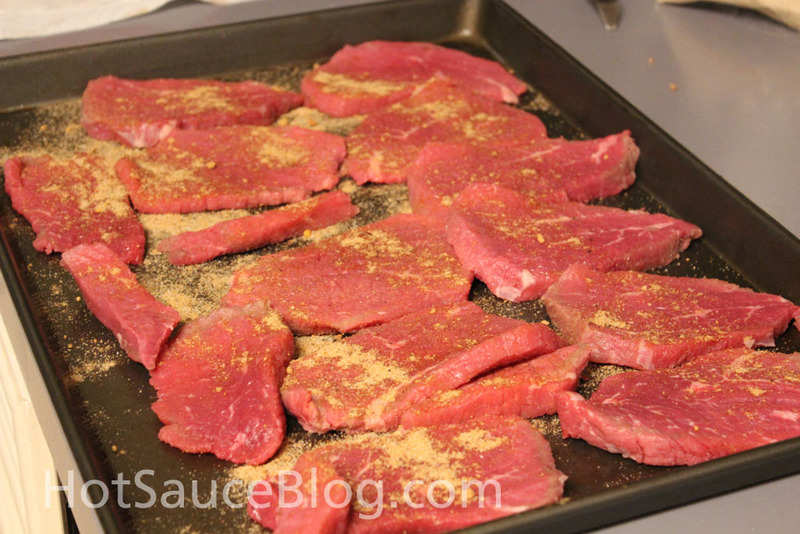 Then layout on a sheet pan and coat with seasonings per the directions. 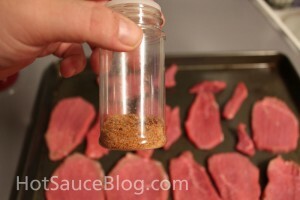 I used 1 tablespoon of cure with 1 1/2 tablespoon of seasoning per 2 lbs of meat. (My 5lbs was reduced to 3lbs or so when the fat was trimmed). 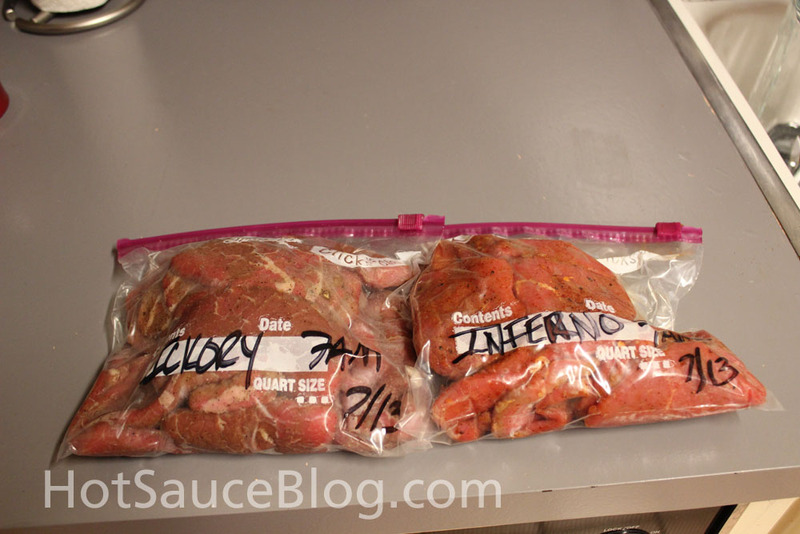 Bag and tag the jerky (label it if doing different flavors) and then refrigerate for 24 hours. I typically do 3-4 flavors each time I make jerky, constantly experimenting with flavor combinations. 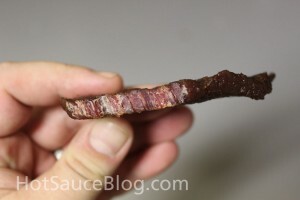 For the Inferno Seasoning, I used 4 dehydrated Nagas and 4 dehydrated chocolate habaneros. The peppers were ground to a fine powder and then mixed with the cure. Step 4: Smoking. 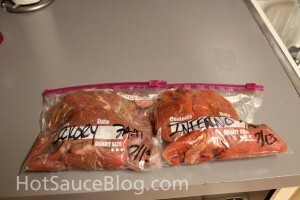 Now your egg is at 200 degrees, you can put the meat on. And now you wait. No peaking. 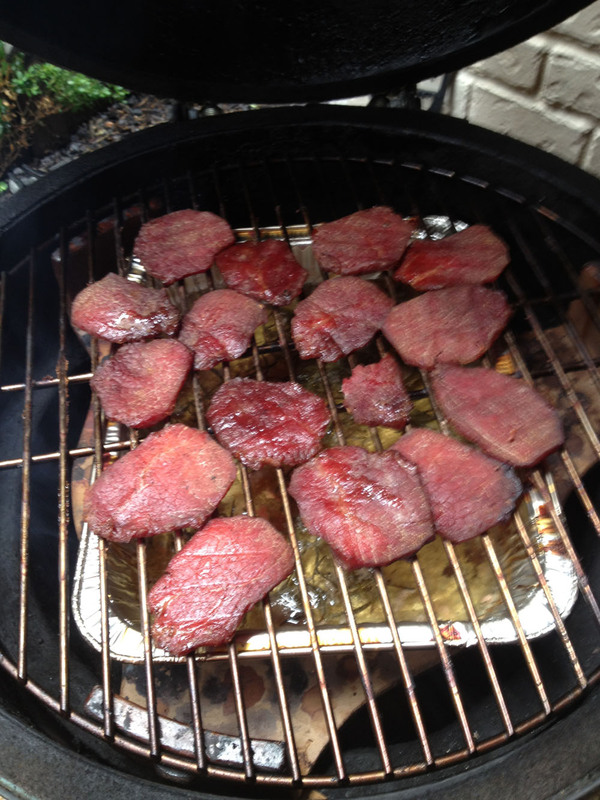 Except every 1 1/2 hour to turn the jerky – you want to turn it to make sure it smokes evenly and that pieces near the outside don’t get to dry – do this quick and carefully, otherwise you’ll lose heat and meat can fall through the grill and the temp will flare up. I started the first batch of jerky around 9am on Saturday, ran errands, came home, turned the jerky and continued with my weekend projects while it cooked. 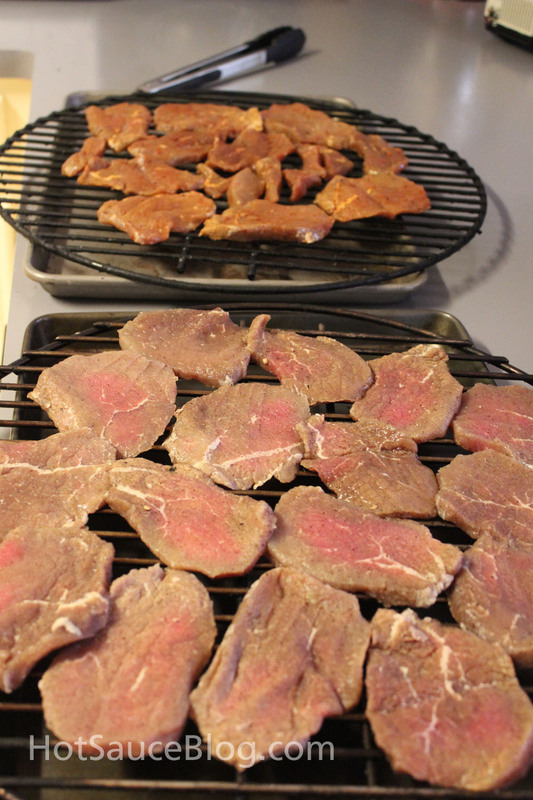 Step 5: Nom nom nom. 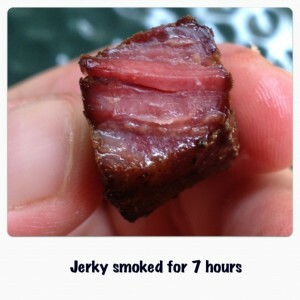 I smoked my jerky for 7 hours. It was done around 5 hours – but I like mine a little smokier and dry. And after 7 hours, it still came out delicious and moist. 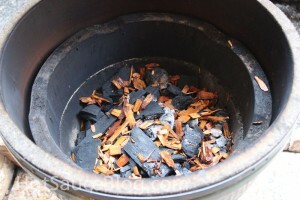 The Naga spice is a great touch – I’ll need to use more next time as it’s not that hot. The heat lingers for a bit but then goes away. Next round of jerky, I’ll be trying out some new dry rubs and possibly another shot at using a wet marinade. 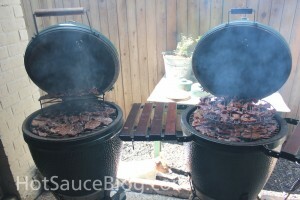 For those of you in Indy, there’s a cool restaurant in Indy that features the BGE- Chef JJ’s in Broadripple. They are BIG supports of my charity and it’s a really COOL place to eat. All of their meals are done on the BGE.